Pregnant, but still need to look professional? Or need something gorgeous for the upcoming holiday party season? 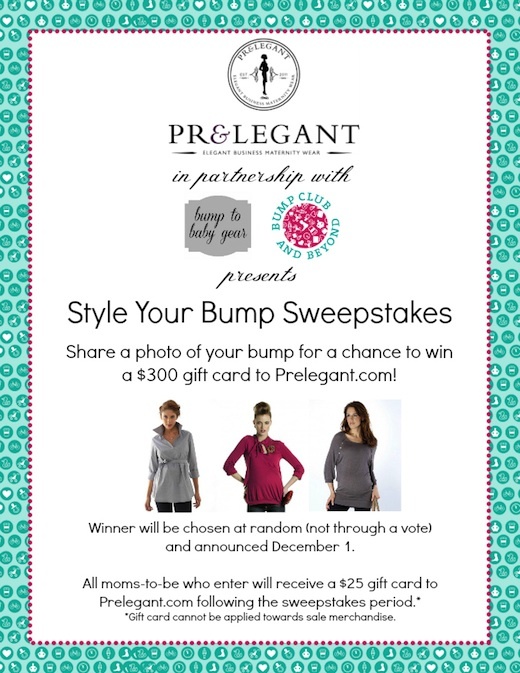 Bump Club and Beyond, PRElegant, and Bump to Baby Gear are giving away a $300 gift card for your own elegant maternity wear from PRElegant.com. To enter, you’ll need to upload any pregnancy picture. One winner will be chosen at random (so don’t stress about how hot your preggo pic is) and will be announced on December 1, 2012. Plus, EVERYONE who enters will received a $25 gift card to prelegant.com for some gorgeous professional maternity wear – perfect for on the job or upcoming holiday parties. Click here to learn more and enter!